Click Here To See Detective Comics #344 Comic Book! 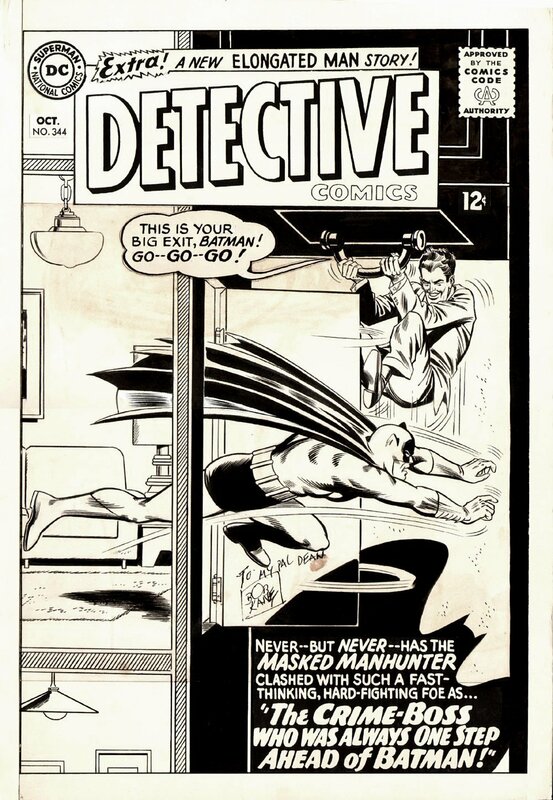 Check out this very nice, very RARE, Silver Age, Large Art 1965 Batman cover, which was penciled by the great Carmine Infantino, and inked by the great Joe Giella, from the story titled: "The Crime-Boss Who Was Always One Step Ahead of Batman!" 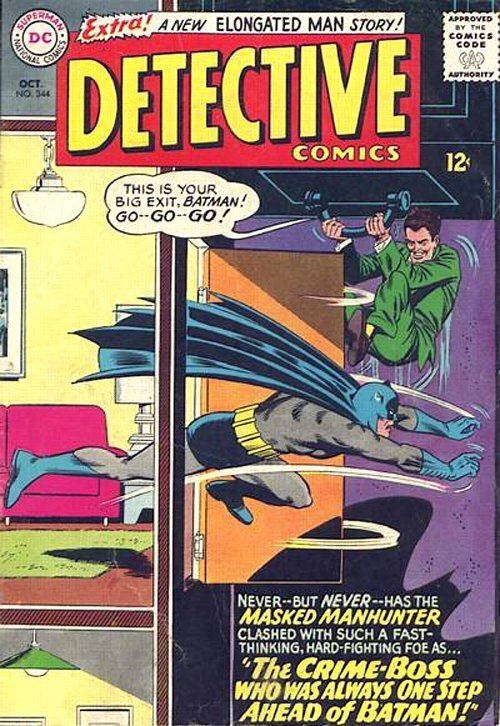 This nice cover features an incredibly detailed LARGE image of BATMAN, as he leaps through a doorway to catch the "Crime-Boss" who has tricked Batman into his possible demise! Silver Age LARGE ART Batman covers are next to non-existent on the open market these days! This cover right here is the very FIRST LARGE SIZED Batman cover we have ever offered for sale on our website over the past 15 years! There are 2 condition issues with this cover, and thankfully, they do not affect the main Batman battle scene. The bottom of the cover was trimmed 2.2 inches into the art which can be seen if you look at the scan closely. At the top of the cover, the "Detective Comics" logo and everything from that area upward are replacement stats and replacement artwork, as the cover was originally trimmed at the top also. There isn't any significant art in those areas above and below the trimmed board area thankfully, as the entire Batman and crime-boss battle scene and all of the back ground areas are all beautifully drawn in every way! Because of this trimming, we are pricing this fine Batman cover accordingly. Without these 2 trimming issues, this cover would be a 100-150K+ Cover! Art is signed in the center and dedicated by Batman's original artist and co-creator in 1939: BOB KANE! Compare this nice cover art to the published comic book in the red link above! ALL HIGH end pieces of art, including this one, are able to be purchased with VERY fair time payment plan options, and trades are always considered towards this and "ANY" art on our website! Just send us an email to mikeburkey@aol.com and we can try to work something out.